German minister for economic cooperation and development, Dr. Gerd Müller. At the end of September the German federal ministry for Economic Cooperation and Development (BMZ) published the intermediate result of the ‘Zukunftscharta’ (Future Charter) process. The draft Charter has many positive aspects, but comes at an inopportune time. In addition, the preliminary Zukunftscharta presents itself surprisingly empty and weak in some parts of its content. Background: The Future Charter process was launched on April 1, 2014 in Berlin by the BMZ as a broad “dialogue process between government, business, academia, civil society, churches, foundations, German states and municipalities”. Its vision is to “bring together in Germany as many actors as possible to define a socially broad-based German contribution to sustainable development within the altered reality both at national and international level”. 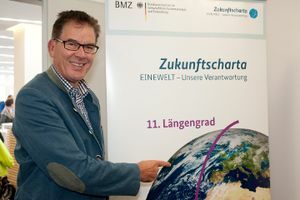 At the end of a very inclusive and participatory preparation process including an open-to-all online dialogue, thematic forums and a ministerial journey through Germany along the 11th meridian stands the first draft of the new German development charter titled “ONE WORLD – our responsibility”. Online on the Zukunftscharta website, the draft was open for comments until October 1. I took the opportunity to submit my comments to the draft charter as a representative of the German United Nations Association the federal board of which I have been sitting on for the last three years dealing with issues of development cooperation and the UN development architecture. Please find my full comment here, mind though that it is in German. Now that the commentary period is over, the Zukunftscharta will be finalized and handed over to German Chancellor Dr. Angela Merkel and Development Minister Dr. Gerd Müller on 24 November in Berlin. On the positive side the Future Charter discusses important issues throughout its seven fields of action that need to both shape the self-understanding of German development policy in the future and align German national politics as a whole coherently and across all sectors with the imperatives of sustainable development. The self-reflexive perspective of the paper, the real challenge for development policy in an era of transition from top-down-designed MDGs focused on poor countries to universally-valid and globally applicable SDGs, is much stronger, much more credible and much more in-depth than in former German position papers. The Future Charter follows the basic tenor of “sustainable development policy begins at home in Germany” (p 2) and formulates the necessity to “rethink and redirect the economy and society” (p 18). Furthermore it promotes the “social change towards sustainable production and consumption patterns” and contains some important concrete commitments – such as the will to implement the UN Guiding Principles on Business and Human Rights with a national action plan. The latter had been requested by the German UNA since early 2012. However, some important issues have unfortunately not made ​​it into the canon of the Zukunftscharta .The topic of “migration” is not mentioned once literally in 26 pages. In terms of content it is (if any) broached only in one of seven fields of ​​action in the context of the world’s 50 million refugees. At this point the Future Charter has urgent need for improvement. References to migration should be included at least in the fields of action 1,3,4,5 and 7. It must also be ensured that migration is discussed not only as a problem that has to be avoided, but rather with a view to the full scope of its potential for positive contributions to development in both home and host country. Similar to migrants, adolescents and young people are never explicitly mentioned in the Future Charter. Special support to young people and the problem of high youth unemployment as a social explosive in many societies around the world seem to have no place in the future German development Charter so far. It is questionable whether the topic ever had an advocate in the preparation process of the paper. Here, too, content improvements are urgently needed: a Future Charter without reference to those people who are the future is unavoidably weak in significance and incomplete in content. Still, the most fundamental problem of the Future Charter and the associated nation-wide process is the unfortunate timing of the initiative. By its own claim the Zukunftscharta shall be promoted in the general public in Germany in the ‘Year of Development 2015’ and “last but not least also advance the implementation of the internationally agreed sustainable development goals” (p 3). However, if one considers the limited attention span of a German public anyway not completely enthusiastic of global development issues, the coincidental publishing of both the finalized Future Charter and the new SDG agenda is most unfortunate. In 2015, raising awareness in the German public of a new global development agenda has a much higher priority compared to the campaign for a national, largely decoupled developmental Charter. Similar in content, two target systems for essentially the same political field will yield misunderstanding, confusion and head shaking with many German citizens – understandably so! This situation risks resulting in an ‘own goal’ for German development policy, even if the Future Charter overcomes its weaknesses until November 24 and proves itself a substantive masterpiece. In any case, German development minister Müller should ensure that in 2015 enough time, ministerial will and financial resources are available for a comprehensive information campaign that does justice to the high relevance of the SDGs instead of focusing on sales strategies for his in-house product only. A further unfortunate coincidence is the fact that the broad stakeholder participation process for the formulation of the Future Charter took place at almost the same time as the non-transparent and hardly participatory formulation of the German negotiating position for the SDG process. This considerably clouds the otherwise joyful character of the Future Charter process. Statements on the Zukunftscharta webpage such as “This is your opportunity to help shape the future – the world needs your opinion!” are misleading, since it is questionable what exactly the German public should be able to shape. The further use of the Future Charter is dealt with in a tight sentence: “From November 25th onwards the realization of our common goals begins: ONE WORLD – our responsibility.” Genuine participation would have meant that the results of the Zukunftscharta process may at least help to shape the German SDG position. However, a feed-in into the German position for global negotiations now going on in New York is not provided. Pity! For a universally valid and globally applicable new development agenda that takes into account national priorities and circumstances would have profited well from finding out what possibilities Germans see to “build a future that allows for responsible action and at the same time does not restrict us in our lives “(Future Charter website). This entry was posted in commentary and tagged development, development cooperation, development policy, MDG, SDG, United Nations. Bookmark the permalink.